Why is Rachel hesitant to embark on the renovation with Hal? How does her hesitation evolve into her coming to view renovation of the house as a life journey? Discuss the symbol of the trees that grow over the "No Parking Any Time" signs. Discuss the role of community in Rachel making her decision. Have you ever made a major decision reluctantly, and then come to see it as a transformative experience that was actually helpful to you? Rachel describes her "Search for Life Purpose 2.0". In what ways does this search change over time? What does she discover her Life Purpose 2.0 to be? Have you had your own version of a Search for Life Purpose 2.0? What answer did you reach? In this chapter, Rachel also explains her struggle to understand love. How did she envision love during the first relationship with Hal, and how did that change over time? Has your own understanding of love changed over time? If so, what had it been and what made it change? Rachel realizes she finds packing to be so difficult because it involves a reliving of the past, and in many cases, grief for what has been lost. To what extent does she come to terms with this realization? How does her experience packing compare with yours? What emotions has packing brought up in you? Discuss an object you've had trouble parting with because it embodies important memories. On moving day, Rachel expresses that, although the past cannot be reversed, "we can choose whether we keep plodding the same rutted road, or take a turn we'd never thought was ours to take". What leads her to say this? She also recounts her decision to forgive her mother. Was this a good decision? Have you ever forgiven someone whose actions hurt you deeply? If so, did you make that decision on the spot, as Rachel did, or did you come to it more slowly? Do you agree that on moving day, "stuff happens", and if so, can you share some "stuff" that happened on a moving day? When the door in the rented house locks Rachel out of the bedroom, she finds herself in a seemingly impossible bind and has only minutes to find a solution. What lesson does Rachel discover that allows her to rise to the occasion? How does it relate to her experiences in the disability community? What does she learn about herself in the process, and how is that reflected in the anecdote about the archeologist and King Tut's tomb that closes the chapter? How have you solved an impossible problem that needed an immediate solution? Rachel comes to acknowledge that she is mourning the lost opportunity to have children. Do you think she comes to terms with her feelings, or is there no complete resolution? Why do you think Rachel weaves images of light into this chapter? What are the various kinds of love that Rachel reflects on in this chapter, and how do they affect her journey from "house sickness" to the final image of her stepping onto what will become a new foundation? What effect did this chapter have on your own feelings about having children, and the people you know who made a different decision than you? Rachel initially attempts to help Beth's boyfriend Jesse, but comes to see that her first responsibility is to her sister. In what ways does this realization strengthen her relationship with Beth? What are the challenges that Rachel attempts to overcome with Laura? Rachel does not discover a way to repair her relationship with Max. What does she conclude about relationships that cannot be restored? How does Hal's discussion of how he worked with Dan, the mechanical contractors, and the engineers relate to the theme of repairing bonds in families? The final scene in this chapter takes place at a Halloween block party in Rachel and Hal's new neighborhood. Why does this moment give Rachel a reason for hope? Did this chapter lead you to reflect on your own relationships with your siblings? How? What were some limitations of Rachel's previous "not-seeing" state? To what extent does Hal show her how to see and appreciate the design of buildings? How does Rachel's use of the Detroit airport tunnel link the themes of design and kindred spirits? Have you had a similar experience of finding a kindred spirit in an unseeing crowd? Rachel encountered Hal by chance and felt a sense of familiarity with him even before they spoke. What do you make of this beginning to Rachel and Hal's history together? Does this chapter give any one answer about how we find kindred spirits? Do you believe there is one answer, and if so, what is it? In what ways does Rachel's history with her mother Rosalie contribute to her reaction to Rosalie's health crisis? What does Rachel learn about herself as she helps Hal to build the backyard wall? Discuss the importance of perseverance when confronted with challenges. How do bliss and grief come together in this section? Have you ever had to provide support or be a caregiver for someone with whom you have a conflicted relationship? What have you learned from that experience that overlaps with what Rachel shares here? Are there lessons you would add? How does Rachel's decision to see herself as a student help her cope with the disaster at hand? When Hal and Rachel realize that they are both students and in the same situation together, the situation seems more bearable. What challenges are made easier by their sense of solidarity? In what ways can individuals in any stage of life benefit from being a student? What emotions does the description of the surviving baby tree evoke? Have you ever experienced a sudden disaster, and if so, did you approach the aftermath as an opportunity to be a student? In what ways are Hal and Dan allies in this chapter? How does Rachel become their ally as well? Discuss Rachel's relationship with the therapist Robin. How does Robin's encouragement strengthen her and give her a sense of hope? How is having a professional ally different from having an alliance with a friend and family member? How are the various types of allies similar? Can you think of a time when having an ally helped you in some way? What about being one? Why did Rachel avoid asking her mother about her lighthouse trips in the past? What makes her change her mind? Rosalie tells Rachel the story of the famous lighthouse keeper Ida Lewis. How does Ida's attempts to be there for her family and strangers in need relate to Rachel's struggle to be there for both Hal and Rosalie at the same time? In what ways does her newfound appreciation for the lighthouses help Rachel to improve her relationships with Rosalie and Hal? Have you ever felt a lack of interest in the passion of someone you love, then pushed yourself to learn more about it? Did that help your relationship? Rachel brings up the point that being in a marriage is more than just loving and being committed to someone; it also means to "act on [my] commitment" (225). What do you think it means to act on commitment? What resolution do Rachel and Hal come to in this chapter, and how do they get there? Can you discuss how you came to understand commitment, or whether you're still trying to do so? What does the anger Rachel deals with at the end of the renovation process ultimately stem from? How does she tie together renovation of the house with love in this chapter? Do you feel that she comes to accept the difficulties in both? Rachel returns to her search for meaning, and finds that she doesn't yet have the answer to what she wants to do with the rest of her life. What do you think Rachel learned from the renovation process? At the end of the chapter, Rachel returns to the story of archeologists discovering Tutankhamun's tomb, and of the recent discoveries that had been overlooked for years. What, at this point, does Rachel realize about herself that she hadn't realized earlier? If you have gone through a home renovation or other major life experience with a family member or romantic partner, how did you change by the end? The final image Rachel leaves us with is that of the baby fringe tree, which survived despite the explosion, and blossoms in the spring. It endured, and even thrived in spite of its past. How does this relate to Rachel and Hal's past, and to the theme of renovation? What does this image mean to you? Lastly, this house is on Teacher's Lane. 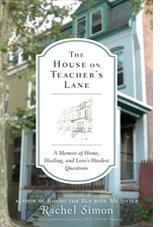 Rachel is a teacher, but over the course of the book, the renovation teaches her a great deal. If you had to rename the street on which you live, what would you call it?